Ah, the nostalgic memories of making new friends on the first day of class, the thrill of getting a new Trapper Keeper notebook and finding your place amongst your peers likely take most of us back to our school days. Once you’re out of school, you realize that you don’t always have teachers by your side to help you plan for how to approach strategies like content marketing. There’s no lesson plan, pre-test or extra credit to help you figure everything out. And the true test comes from how much your audience likes (or doesn’t like) the content assets that you create. Which presents an opportunity to innovate your approach. Influencer marketing is a fairly new concept that many marketers are buzzing about, but few actually know how to approach successfully. For those that are successful at incorproating influencer marketing into their content mix, they are earning an average of $6.85 in media value for every $1 that they spend on paid media. 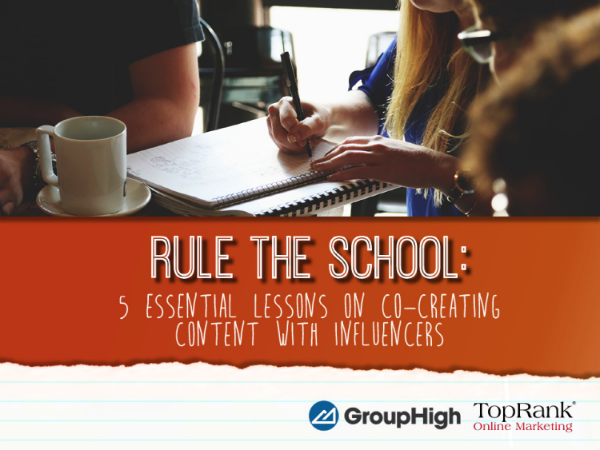 To help you pass the influencer marketing test, TopRank Marketing has tapped into the minds of 10 marketing executives at major brands to bring you a new eBook that provides five essential lessons for embarking on a co-created content initiative. 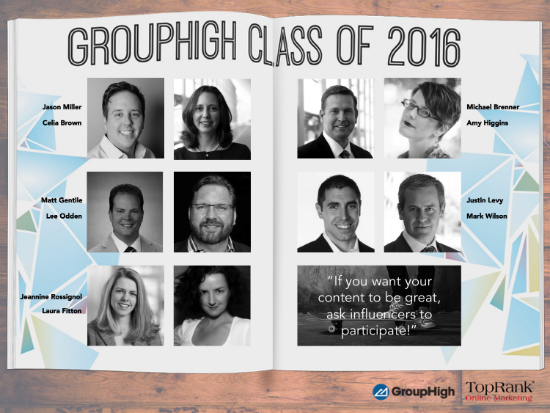 This project was sponsored by GroupHigh, a software-as-a-service marketing application that allows marketing teams to build, evaluate, and manage one-to-one-to-many marketing relationships. Are You Ready to Rule the School? Get ready for an intense course on influencer marketing that includes 5 essential lessons, cheat sheets from today’s top brands and homework for each lesson to help you put everything you learn into action. Test your knowledge by downloading the FREE eBook today!